The standard office is usually based on an estimate of 150 to 200 square feet per person, plus 10% to 15% for flow. This “Rule of Thumb” assumes a floor plan that is evenly split between open space and private offices/conference room. Some office users (law firms, medical offices) require more square feet per person because they have additional requirements for the office space (law libraries, multiple conference rooms, oversized reception areas, patient exam rooms). 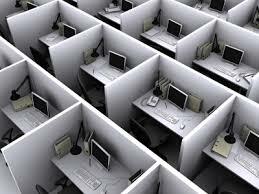 Other office users can reduce square feet person by utilizing a floor plan that is almost completely open. Corridors and Circulation: 20-25% of the total usable areas. If you have additional questions about an office lease renewal or an office relocation, please read 10 Tips for Office Tenants in a Renewal Negotiation and How to Find the Right Office Location in 10 Steps. You may also contact me at troy@goldengroupcre.com or (630) 805-2463.